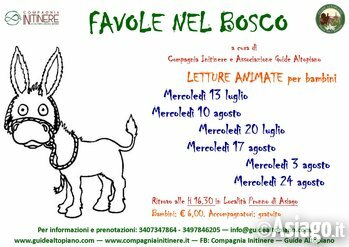 From July 13, 2016 Baez actor of the Company InItinere and the component Guides Plateau offers animated readings in the woods for children. The meeting time is at 16.30 at the locality Prunno di Asiago near casetta delle Guide. 6 euro boys, free guides. Animated reading performed by Jose Baez Environmental naturalist guide and professional actor of Ongoing Company. Are necessary for walking the walking boots, long pants, fleece, k-way.